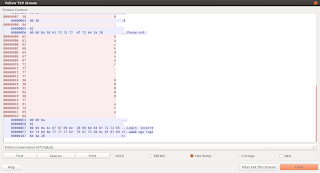 In level09 of Nebula wargame, we have a vulnerable PHP script wrapped by a setuid binary. The program gets a filename as a command-line argument, reads the content of the file, apply some regular expressions modifications to the recovered content and prints it. Searching further in the PHP preg_replace() documentation and pattern modifiers, we find something juicy: "e" modifier is actually PREG_REPLACE_EVAL. Pretty much everything is detailed in the pcre pattern modifiers page on php documentation. Let's exploit this. We will leverage the $use_me variable that comes as second argument of flag09. level09@nebula:~$ ../flag09/flag09 /tmp/pwn09c "/bin/getflag > /tmp/pwnie09"
In level08, we have a packet capture file to analyze. First we get the file to our local machine. 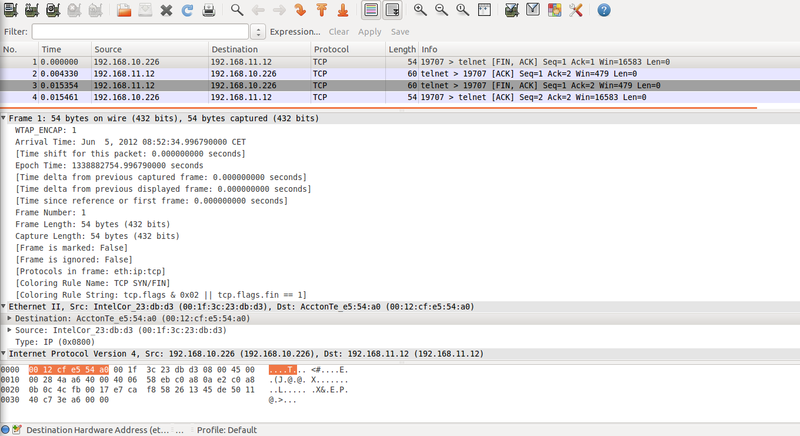 Opening the file with Wireshark, we see a TCP connexion between two hosts. The many "." 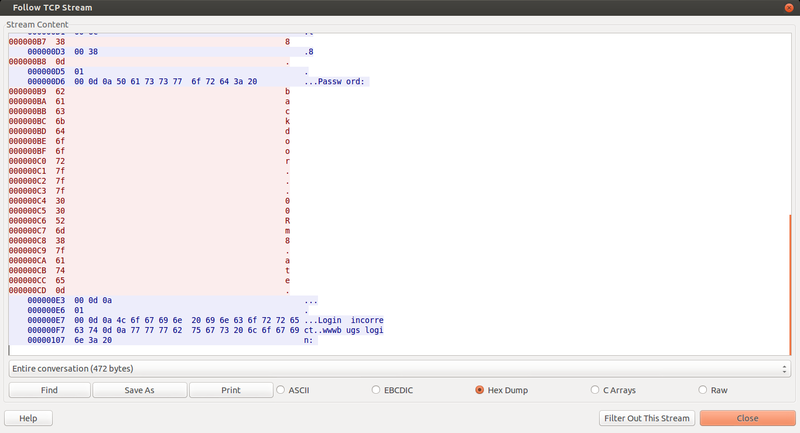 after "Password:" are non-printable characters, and we switch to hex dump view to see their value. We login into the flag08 user account using the newly found password, and getflag! In level06, we are told that the account credentials for flag06 user account come from a legacy unix system. Let's go straight to the bank. Back in the days, user password hashes were stored in /etc/passwd file. This is no longer the case as they are stored in /etc/shadow which is only readable by root (and shadow group). We will use John the Ripper in order to find the password. JtR will go through the passwords in the provided word-list one-by-one, comparing the hash of each word with the hash found in /etc/passwd. The operation will stop once we find two matching hashes, thus guessing the right password. The password is hashed using unix' crypt. It didn't take long! the password is quite trivial, "hello". We login using the flag06 user account and getflag! This is the write-up for level05 of Nebula wargame. We are told to check the flag05 home directory and look for weak permissions. drwxr-x--- 4 flag05 level05 4096 2011-11-20 21:22 .
drwxr-xr-x 43 root root 4096 2012-10-14 07:20 ..
World readable backup! Checking the directory content, we find a gzipped tar archive. drwxr-xr-x 2 flag05 flag05 4096 2011-11-20 20:13 .
drwxr-x--- 5 flag05 level05 4096 2012-10-14 10:47 ..
We copy that to our local machine using netcat. And extract the archive with tar utility. An ssh key, just there, waiting to be used. We can use that to login with the flag05 user account. In level04 of Nebula wargame, we are tasked to exploit flag04 binary to read a token file. The source code of the binary is provided. The part of the source in bold is responsible for checking that we are not providing "token" as the filename to be read. The trick is, we can access token indirectly, through a symbolic link. the open(2) system call would have failed if the O_NOFOLLOW flag was provided. In level03 challenge of Nebula, we are told that there is a crontab running every couple of minutes. writable.d is a directory and as its name suggests, is world readable/writable. writable.sh is the script that is executed every couple of minutes by the crontab. The vulnerability lies in writable.sh running every file that in the writable.d directory combined with the fact that writable.d is world writable. To exploit this vulnerability, we will write a script that will run the /bin/getflag program when executed. After some time, the pwnie03 script will be run (and deleted afterwards by writable.sh). And that is it, level03 done. 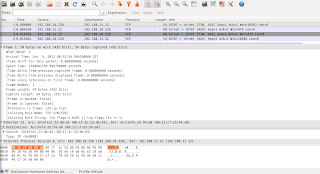 We have the to find an arbitrary program execution vulnerability. The interesting part of the source is in bold. The flag02 program runs /bin/echo providing it with an argument that starts with the value of the environment variable USER (which is returned by the getenv() library call). We do have total control over the USER environment variable. To exploit this attack vector, we will change the value of USER to a malicious value (e.g to run /bin/getflag or /bin/sh to get a shell as flag02). get ready is just what /bin/echo will print on the standard output. We could skip it as it is not really needed. semicolon (;) is used in shell to separate commands, without it, /bin/getflag will be printed by echo. the # sign signifies that what comes after ("is cool") is just a comment. It is not necessary, but if not provided, after getflag is run, bash will whine about not finding "is" command. The system() library call executes echo "and now what?" but instead of directly running /bin/echo, it uses /usr/bin/env to find the location of echo. Ever came across scripts starting with #!/usr/bin/env python ? This is used for portability issues, as fixing a path (such as /usr/bin/python) wouldn't work when the Python interpreter is installed in a different location. How does env look for the specified program ? 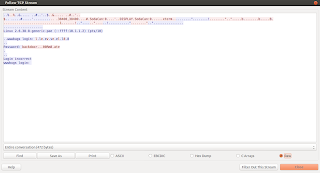 it simply searches in the directories specified in the PATH environment variable starting from the the first directory, and going through the directories in $PATH until it finds the looked-for program. How to attack this program ? We will prepend to $PATH a directory in which we will add a symbolic link echo pointing to /bin/getflag. Now flag01 will run our own /home/level01/echo that is simply a symbolic link to /bin/getflag. 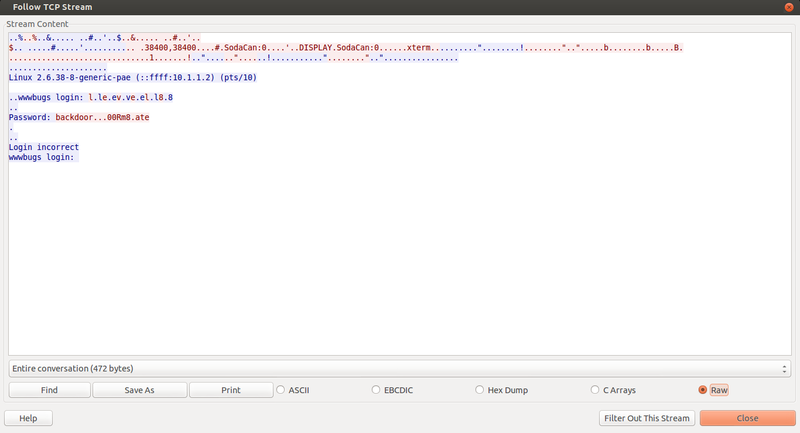 In order to solve level00 challenge, we have to find a setuid program that will run as the "flag00" user. file / starts looking from the root directory. -user flag00 doesn't need much explanation. 2> /dev/null is a redirection of /dev/stderr to /dev/null. It is not necessary, but we don't care about the "Permission denied" errors, just the file we are looking for.